Having a sculpted upper body is the desire of almost all the people who wish to get into the fitness regime. The perfect way to get your upper body exercised is by doing chin ups or pull ups. They are easy to do and are very effective in building your core strength. Chin ups are particularly effective in working out your shoulder muscle arm muscles, upper back and even your abs. With them, well-built abs can be a reality in no time. All you have to do is pull your whole body up using your arms until the point you make your chin reach above the bar just like the name explains. Pull-ups are somewhat similar to chin ups. However, the only difference is that they use an overhand grip while exercising. A pull up bar or chin up bar is simple equipment that will help you do chin ups with ease. There are a variety of options for you to choose from. There are freestanding bars, removable bars, and screw-in type bars all of which must be chosen based on your convenience. It is a piece of simple equipment and it doesn’t have any kind of complexities. Chin up bars or pull up bars can easily be attached between two adjacent doorway. You even have the facility to use it with different other fitness machines. Chin up bars are made with one user in mind. Letting people lift their own weights up on the bar and use it to build muscle strength. Pull-ups can be very effective in building your body muscles. It will help you in developing upper body strength and the lower back simultaneously. What to Look For In a Chin-Up Bar? As we have told, it is simple equipment so there are not many places where you can go wrong but this also means that whatever is present has great significance and if you go wrong somewhere you will have a lot to regret. 1. Maximum Weight Capacity: The best chin-up bars we reviewed had the maximum weight capacity more than 300+ lbs. Cheaper ones will be on the bad side here. They might only have a weight capacity of 230 lbs. This literally means that you will be risking injuring your body if you are heavy and choose to work out on pull up bars. 2. Stable: The chin-up bars are made to carry all your body weight so they have to be stable enough to support all your body weight or else you will break the bar and break your back instead of shaping them. The chin bars must not even flex while you are hanging on top of it. You can determine the stability of the chin up bars by analyzing different factors. For example, the way the chin up bars are attached to the wall can help you understand whether it has a stronghold or not. 3. Strong: As you might already know, the chin up bars are fastened to the walls for a secure stay. Since these the walls are expected to be strong enough, they will provide enough strength to hold your weight. The bars are connected to the walls using plugs that are situated on both the sides. The stronger the connection between the plugs and the wall the more secure it is. We would advise you to use a heavy duty drill which usually has a hammer function for driving the bit into the wall. And it will be best if you can attach the chin-up bars to strong concrete so that you can be sure that they are not going to fall apart under heavy weight. 4. Great Warranty: Chin up bars are safe enough to hold your weight so you can trust them to hold you when you suspend your weight on them in the doorways. Of course, with the change in price, there are multiple methods used for fastening the chin-up bars to the wall. The best chin-up bars come with the door-jamb bars which have pins and plugs that you can use to secure them. But, if you are getting cheap variants, then you will have to manually adjust the bar and the kind of fastening will be based on rubber end plugs that you will be using to connect to the walls. Make sure that the chin up bars are meant for heavy duty and have long-term warranties so you can expect them to last for a long period without breakages. Above all, just check the maximum width of the chin up bars and match it up with the doorway you are planning to use it at. Otherwise, you will end up with something that you can’t really use. The best chin-up bars that are in the premium category can support heavy users. They usually have the maximum weight capacity of over 300+ lbs. While the cheaper ones will max out at 230 lbs or maybe worse than that. Consider your weight and the weight of the people who will be using the chin-up bars and then choose a chin-up bar that has a little more weight capacity above your total weight. These pull up bars usually weigh between 8 – 15 pounds. And this is their free weight in the assumption that you haven’t combined them with any other equipment. Some of the best chin-up bars come with resistance bands and suspension straps which can very effectively be used for developing your core muscles and also in developing six-pack abs. Chin ups are very useful equipment but that doesn’t mean that it is difficult to use them. They are very simple to begin working with. All you have to do is get a good hold of the bar and pull your whole body up. Pull up until your chin reaches above the bar. Make sure that your hands are kept at least 12 inches apart from each other while pulling yourself apart for a proper pull-up. Once your chin goes above the bar slowly bring them down and low your body. Repeat it as many times as you can do. The key benefit you get from bodyweight exercises is the consistency and the frequency of the workouts. Chin ups are particularly effective on building the lower back muscles but with consistency, it can even benefit your arm muscles, chest muscles, and other body muscles. The pace of exercising is a personal choice you need to make. There are some trainers who find training with lower pace as beneficial to building core strength quicker while others recommend doing the chin-ups with greater pace. Ultimately, it depends on your convenience but what we could confirm is doing the chin ups repeatedly for a long while can certainly be beneficial. You might have noticed that we mentioned about the placement of hands as something important during workouts. It actually is! Hand placement is not just focused on providing stability to your body while you pull yourself up but it can alter the effects of workouts. If you want to develop the back side of your muscles or your underarms, then you might need to move your hands wider away from your shoulders. Similarly, lower back body muscles can also be targeted during chin ups. Working out your buttocks, stomach, and thighs will strengthen your back and give some variety into your workouts. Lower back can be trained by lifting your knees at right angles when you lift your body up on the bar. What we told now is just the tip of the iceberg. There are a variety of exercises you can try out using a chin-up bar. And this is one reason why chin up bars remain as the favorite equipment for a lot of people. In a nutshell, every single part of your body muscle can be worked out if you know how to shift the focus to them during chin ups. Upper body workouts can easily be done by using a chin-up bar. All you have to do is lay on the floor flat and while keeping your body posture straight use your arms and shoulders to lift your body up towards the chin up bar. The body weight will work against your arm muscles and shoulders, your deltoids and forearm muscles will develop during this process. The frequency of your workouts determines the development that you will observe on your body. So, the number of times you do the workout the better your muscles will be. After practicing chin-ups daily, your body will easily get used to exercising and will get mature enough to get to the next level. The next step you could do is full standing pull up. In order to do this, it will be good to take the assistance of a chair and adjust the chin up bar to a point where you can easily jump and grab. It should be in a way that you can easily jump and grab them and suspend your body freely. Depending on the position of the bar, you can either stand still and hold the bar or simply jump and grab the bar in such a way that your fingers are facing towards you. For a proper balance, it will be better to bend your knees to cross the ankles. After doing this, slowly pull your whole body up until your chin reaches the level of the bar. 1. The popularity of chin-up bars can be contributed towards the simplicity of operation while helping you to perfectly tone your body muscles. 2. They are comparatively cheaper than much other fitness equipment that offers similar benefits. Moreover, they are cheaper to buy and lighter than all the other fitness equipment. All you have to is buy the best chin-up bar, install it in a comfortable position then start working out. 3. You don’t need to spend the extra cash for their maintenance. From what we have seen, the chin up bars is an investment for a lifetime they’ll never get damaged after working out for a long period. 4. As we have told already chin up bars are compact. It can be placed in any place you want them to be. Since it doesn’t take up any space this is an ideal choice for people who are conservative regarding space. 5. Weights and workbenches are all simple in their own ways but they pose risk to the children and pets that move freely in your house. You don’t have to worry as the chin up bars is not going to hurt either of them. In simple terms, we can say that it is just a piece of stick that could be used for working out. 6. What you won’t believe is that they are now being recommended for relieving your body from physical ailments. So, don’t be surprised if you find one of them in the physical therapy centers. They can help in removing joint pains and the kind of muscle pain that might occur on your muscles due to unexpected tiresome works. 7. To understand the extent of the impact caused by chin-up bars, you must know the muscles that are being worked out during workouts. Generally, when you do chin-ups, more than 12 different muscle groups are being used. 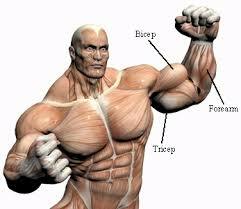 Muscle groups like deltoids, biceps, triceps, trapezia, and latissimus dorsi are all worked out together. 8. What you might not see initially are the additional exercises that you could do with chin up bars by combining them with other equipment like gravity boots. You can easily do inverted sit-ups or upside down crunches and a lot of other exercises focused on your glutes. 9. The primary focus is given to your arms during every chin-up. By using chin-ups as a form of physical therapy, you can easily build up muscle strength on your arms and this will help in getting rid of the joint pains that generally occur. To get the best result we would advise you to do 3-4 sets of chin-ups in great speed. This is a form of anaerobic exercise which is considered to be very effective in burning body fat. If practiced regularly, your body will get leaner and it will also help in increasing the blood flow throughout your body increasing your body health. Chin-ups can help you do other exercises with ease. Your body will easily get used to the effort required in doing chin-ups and will make exercises like rowing, tug-of-war and other similar exercises better. Very often, we see organizations using the ability to do chin-ups as a standard to measure the physical capacity of the people whose health and strength is demanded in the profession. Chin-ups are a kind of body weight exercise that lay more emphasis on your back muscles but with little variation, you can work out almost all the muscles in your body. The largest muscle on the human body that runs near your spine, latissimus dorsi on the lower back is worked out really well during chin-ups. A person who does chin-ups frequently can notice the difference in strength of his latissimus dorsi. Chin-ups also help in developing biceps. Since your whole body weight is used for biceps training, you may not even require working out later with weights for your biceps. Since your underhand grip is used more during chin-ups, the biceps are given more stress during each pulls which is a lot more than the stress given to the muscle group during pull-ups. In one way we could see that every single chin-up involves a part of bicep curl being worked out. This is why we can conclude that if bicep training is an important part of your training, then chin-ups are much better as a training method than pull-ups. All that we have said can be concluded in a few words. Chin-ups are a great exercise for building your whole body strength. So, whatever equipment you buy or whatever kind of exercise you do, it will always be advisable to add chin-ups as one of them. From all the equipment we have reviewed and from the knowledge of our experts, we can tell you that there are not many exercises out there that can utilize almost all of the muscle groups in your body. The person whom you admire as a fitness enthusiast will have a history of being worked out with a lot of chin-ups. Being a bodyweight exercise, you won’t need a lot of equipment to begin working out. This reduces the cost of workouts and the complexity involved in starting one. The only thing you need to work out is the best chin-up bar and you are done. If you are determined to work out well, then we will advise you to get started with learning the exercise from a good trainer and then get on it yourself because it is common for people to jump into workouts but not reaping as much benefit as they should because of ignorance.